Colon cancer. 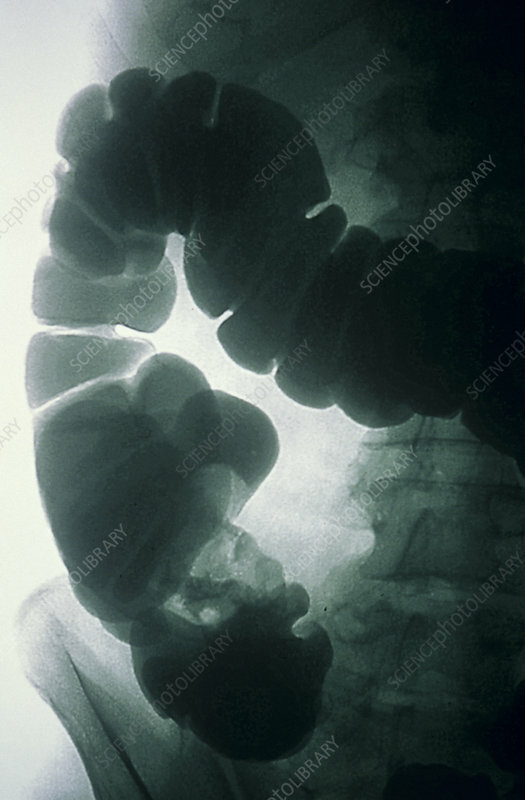 X-ray of the colon of a patient with cancer of the caecum, the start of the large intestine. A malignant (cancerous) tumour is seen at lower centre (pale area). Symptoms of colon cancer include rectal bleeding and abdominal pain. Treatment is with surgery to remove the affected area. Colon cancer is one of the most common cancers in the Western world. It is a disease of late and middle age. Risk factors include a diet high in animal fat and low in fibre and a sedentary lifestyle. The patient was given an enema of radio-opaque barium before the X-ray to show any anomalies.